In previous bulletins, we described how climate change is altering the frequency and intensity of certain types of extreme weather (see Climate Change and Extreme Weather: Part 1) and how these extremes shape plant communities, forest health, and the global carbon budget (see Climate Change and Extreme Weather: Part 2). This is still front and center, as there have been many record-breaking extremes across the globe in the last few years (Otto 2016) and an increasing prevalence of heatwaves and/or heavy rain events in many regions. 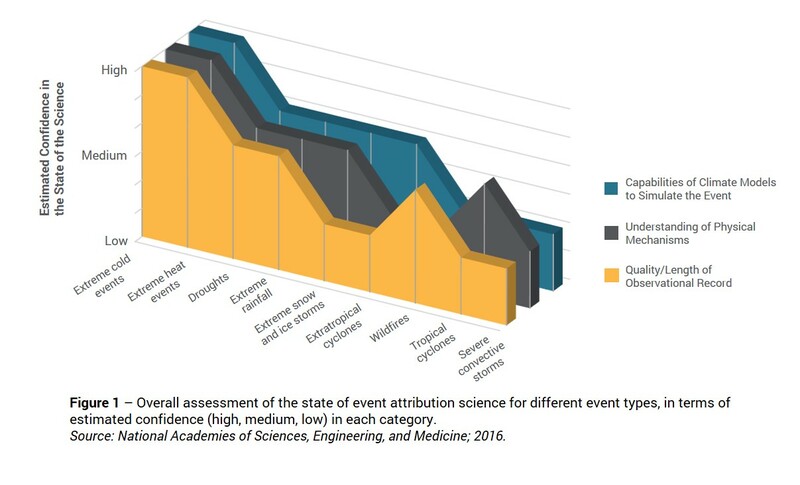 In this bulletin, we are highlighting the science of extreme event attribution—an emerging field of research aimed at estimating exactly how much human-induced climate change contributes to individual extreme events. In some cases, scientists can now go beyond the often repeated line that “no individual weather event can be attributed to climate change” and instead provide quantitative estimates of how much the likelihood, frequency, or magnitude was influenced by anthropogenic warming. This information improves climate risk assessment and can help determine the appropriate management response, by differentiating between truly rare events and those that represent part of an on-going trend that warrants a shift in management. Over a decade ago, many thought it was essentially impossible to attribute individual weather events to climate change with any degree of certainty, but a new field of inquiry was sparked after a commentary in 2003 raised the question of liability for damages from extremes. The 2003 European heatwave was the first event subjected to this type of attribution analysis and researchers found climate change more than doubled the risk of such extreme heat (Stott et al. 2004). Since then, the field has taken off and the number of submitted studies about attribution grew by a factor of five between 2012 and 2015 (National Academies 2016). There are a number of cooperative efforts working on this type of research, including the World Weather Attribution project, which is an international partnership providing rapid, near-real time analysis of major extreme events. Another is the weather@home project, which uses regional climate models (run through a volunteer computing network that is part of the climateprediction.net platform) to determine how climate change affects weather on a smaller scale. There are two general approaches in this type of research—utilizing the historical record or modeling—and a hybrid approach is most common. In the former, researchers look at the historical context to see whether the rarity of an observed event (e.g. heatwave, heavy downpour, etc.) has changed over time. They may also look to see whether the recent extreme is different in any way from similar meteorological events in the past. In the latter, researchers run model simulations of the climate with and without human influence to see whether anthropogenic carbon emissions changed the probability or intensity of a particular type of extreme. With the modeling approach, there are a number of metrics that quantitatively describe the change in risk. A common one is Fraction of Attributable Risk (FAR)—the portion of the risk of a particular extreme that is attributable to human influence, where FAR = 1 means all of the current risk is attributable to human-induced climate factors and FAR = 0 means all of the risk is attributable to natural factors (Pall et al. 2016). For example, the Australian summer of December 2012 to February 2013 was the hottest on record and an attribution study revealed the FAR for average summer temperatures was 0.72, meaning there was a more than threefold increase in the risk of record summer temperatures as a result of human influence on the climate (Lewis and Karoly 2013). There has been rapid progress over the last five years, both in the sophistication of the science and the speed with which attribution assessments can be done. In many cases, an assessment can be made within weeks, as compared to months (and publication of results long after the event). This is thanks to improved scientific understanding of the climate and weather mechanisms that produce extremes, advances in methodology, and increases in computing power (National Academies 2016; Pall et al. 2016). As an example, researchers with the World Weather Attribution project were able to turn around an attribution assessment for the May 2016 European flooding less than two weeks after the event. A solid understanding of the physical mechanisms underlying the extreme event. Consistent evidence from a high-quality observational record. Climate models that accurately simulate and reproduce the class of extreme event. Meeting these criteria yields the most reliable results, but it is more difficult to “check all the boxes” for some classes of extremes, which is why uncertainty often depends on the type of event in question. There is more confidence in attribution studies about extremes directly linked to temperature (e.g. heatwaves) than about extremes indirectly related to temperature that are driven by multiple factors (e.g. convective storms or wildfires). Generally, the more direct the link with temperature, the easier it is to determine attribution with a great degree of confidence (Climate CIRCulator 2016; National Academies 2016). This hierarchy is reflected in Figure 1 (below), which ranks various extremes in terms of the criteria mentioned above. Extremes directly related to temperature are toward the left and as you move right the extremes are more indirectly related to temperature and more complex in terms of the underlying mechanisms. Wildfire, for example, is a complex phenomenon that falls toward the right of the figure in terms of attribution confidence because the intensity and occurrence is not directly related to temperature, but is instead related to many factors, including humidity, antecedent conditions, fuel loads, and others (as we discussed in a recent bulletin on wildfire). Texas experienced a record-setting drought and heatwave in 2011 that had far reaching impacts, including on the forest industry. Not only were there a record number of acres burned in wildfires that year, but commercial timber losses from the drought were estimated at $755 million (with only 13% of that due to fire), according to the Texas Forest Service (Hoerling et al. 2013). Analysis revealed that the biggest factor contributing to the intensity of the heatwave was a precipitation deficit driven by changes in sea surface temperature, including a La Niña event. This natural variability explained about 80% of the temperature increase associated with the heatwave, but an additional 20% was attributable to human-induced climate change, specifically summertime temperature trends (Hoerling et al. 2013). This is an example where an extreme was largely caused by natural processes, but anthropogenic warming likely made the overall impact and damages worse than they may otherwise have been. Extremes can have a huge influence on forest health, composition, and productivity (as we described in a previous bulletin) and event attribution research will help more accurately pin down the role of climate change in these events. This improves our understanding and helps avoid over- or under-estimation of the risks. This is important because the way we perceive and frame the causes of an event influences how we respond to it, including post-disaster actions, preventive practices, and adaptation or mitigation initiatives (Lidskog & Sjödin 2016). If attribution studies suggest a particular extreme event is part of an on-going trend (rather than a rare, one-off occurrence), it makes sense to take action that reduces that risk in the future. For example, a homeowner whose property is severely damaged by a storm surge may decide whether to rebuild or relocate based on this type of information because it sheds light on whether they can expect a repeat in the future. A major storm event causes numerous blow downs in forest stands. A subsequent study suggests that a storm of that magnitude was twice as likely because of climate change. With the expectation that these types of storm events may become more frequent, you divert resources toward pro-active management that develops increased wind-firmness in intact and newly established stands, rather than focusing solely on salvage efforts. A mild drought that would historically leave stands largely unaffected results in some tree mortality due to the subsequent onset of a prolonged heat wave. Studies indicate the extreme heat was largely due to human-induced climate change (e.g. FAR = 0.8) and similar heat events will become more likely in the future. You consider planting more drought-tolerant variants or reducing density in established stands because evidence indicates that particular site will be more prone to drought-related forest mortality going forward. 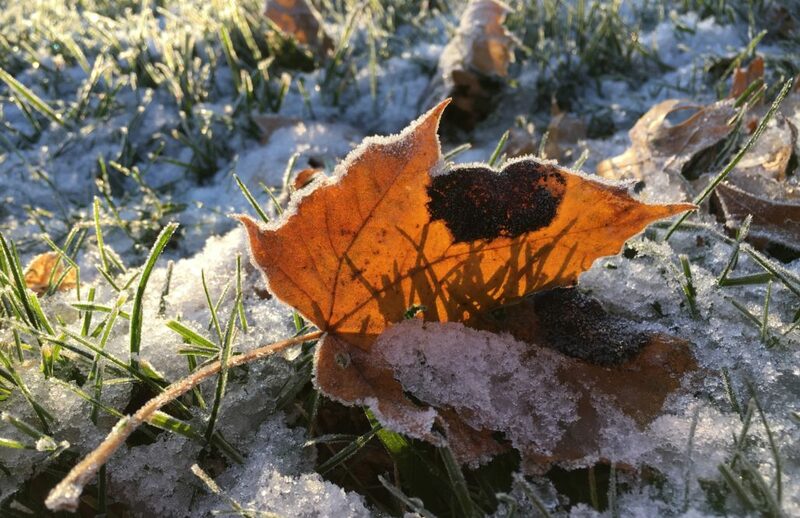 A severe winter storm leads to extensive ice damage in forest stands, but subsequent research indicates the storm was largely the result of natural climate forces and, while rare, icing events of similar magnitude were experienced in the past. You undertake any necessary salvage, but otherwise refrain from changing your management because evidence suggests the storm was an infrequent, but not unusual weather event. Culverts on a forest road, that were sized following the typical standard, wash out during an unusually heavy downpour. Analysis shows the rain event was more intense as result of warming trends. When replacing the culverts, you upsize in anticipation of larger peak flows in the future. Manomet’s Resiliency Assessment Framework, which is currently under development, lays the groundwork for an enhanced forest monitoring system that will improve the quality and length of the observational record for key variables—a necessary component of robust attribution assessments (as discussed above). Our ultimate goal is to discern signal from noise in forest trends, by combining the data from this monitoring framework with the rapidly advancing science of attribution, which will enable more effective management that reduces forest vulnerability and capitalizes on potential advantages. Allen, Myles. 2003. Commentary: Liability for Climate Change. Nature. 421: 891-892. Hoerling, M., Kumar, A., Dole, R., Nielsen-Gammon, J.W., Eischeid, J., Perlwitz, J., Quan, X., Zhang, T., Pegion, P., Chen, M. 2013. Anatomy of an Extreme Event. Journal of Climate. 26: 2811-2832. Lewis, S.C. and Karoly, D.J. 2013. Anthropogenic contributions to Australia’s record summer temperatures of 2013. Geophysical Research Letters. 40: 3705-3709. Lidskog, R. and Sjödin, D. 2016. Extreme events and climate change: the post-disaster dynamics of forest fires and forest storms in Sweden. Scandinavian Journal of Forest Research. 31(2): 148-155. Otto, F.E.L. 2016. News & Views, Extreme Events: The art of attribution. Nature Climate Change. 6: 342-343. Pall, P., Wekner, M., Stone, D. Chapter 3: Probabilistic extreme event attribution. In: Dynamics and Predictability of Large-Scale, High-Impact Weather and Climate Events. Special Publications of the International Union of Geodesy and Geophysics. [Li, J., Swinbank, R., Grotjahn, R., Volkert, H. (eds.)] Cambridge University Press, United Kingdom, 2016. Stott, P.A., D.A. Stone, & M.R. Allen, 2 December 2004. Human contribution to the European heatwave of Nature. 432: 610–614.